Today's mission is to declutter your wallet. We're going to get rid of all the stuff that shouldn't be in there so you can easily find and access the stuff that should be! This task is designed to be done while working on the Organizing Purses & Wallets Challenge, which is part of the 52 Week Organized Home Challenge here on the site. Yesterday we decluttered our purses, and today it makes sense to get rid of the clutter in one of the main things you carry in your purse, your wallet! 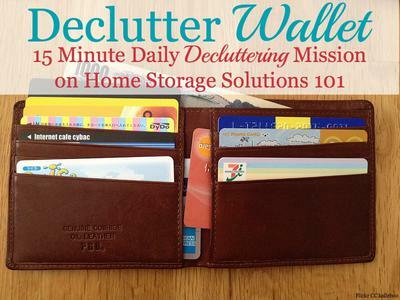 Decluttering your wallet is simple, and follows much of the same instructions as when decluttering your purse. The first step is to take everything out of your wallet so you can actually see what you've got in there. Don't forget all the compartments, even the ones you don't use often, and make sure to empty out all of the change you're holding in there as well. Don't keep too much excess change in your wallet. It weighs it down and isn't necessary, although obviously some is a good things to keep. I highly suggest you flatten out all the bills, place all like bills together, from smallest to largest, and then place them back in your wallet in this organized fashion. It may seem a bit much but keeping your money orderly like this really does help make it easier as you're paying for items. Almost everyone has a couple of photos in their wallet, and I think you should too! They make your wallet special, to see the people you love most in the world each time you open it. Just don't have too many. Go ahead and keep just the most special ones, and a couple currents ones as well so it isn't excessive. One thing I think you should add to your wallet, if it isn't there right now, is an ICE (stands for "In Case of Emergency") card, or add that information to your smart phone. You can read about the options for how to provide this information in this article on the site. What would happen if the item was in your wallet, but it got lost or stolen? To help you with some of your evaluation of what should, and should not, stay in your wallet, here's a short list of items you should not keep in there. Social security card - This is a very important number, but it is one that is like gold to identity thieves. Just memorize it and leave the card at home somewhere safe. Passport - Leave this home as well for similar reasons as with the social security card. It is a huge pain to have to replace your passport and you don't need this form of identification on an everyday basis. Excess cash - I do think you need to carry around some cash for quick purchases and times when credit cards or other forms of payment are not accepted, but if cash is stolen or lost it is gone. So don't carry more than you're willing to lose. Excess gift cards - Unless you're going to that store right then, or quite soon, keeping these cards in your wallet just takes up a lot of room in there for not much benefit. But in addition, gift cards are really just like cash. If they're lost or stolen they're just gone. (Here are ideas for organizing gift cards). Too many credit cards - You should keep a couple of credit or debit cards in your wallet, one for use and one as a back up is ideal, but if you have more than that, why do you need to keep them in your wallet? It just adds to your headache if your wallet is lost or stolen, and gives thieves more ways to steal your money, without much added benefit. Just keep the extra cards at home. Checkbook - I debated whether to put this on the list of items you shouldn't keep in your wallet. Many financial experts suggest you don't carry your checkbook around because it has your address, bank account information, and perhaps even an imprint of your signature on later checks, which would be a wealth of information for crooks. On the other hand, if you use your checkbook frequently it might be a huge inconvenience not to have it when you need it. So just weigh the pros and cons of this one for yourself and make a decision. 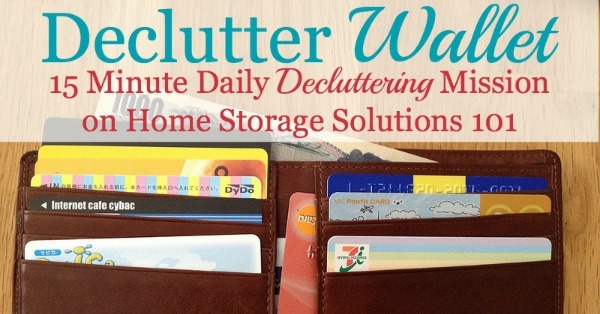 Once you've got your wallet clutter free see my suggestions below for another task I think you should do with regard to wallet organization! 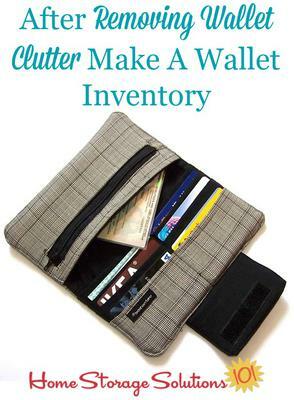 Once your wallet is clutter free there's an additional step I want you to take, if you haven't done it already. I want you to make a wallet inventory. This was actually a Declutter 365 mission in an earlier challenge, but if you haven't done it yet now is the perfect time now that you've got all the clutter out of there. The article linked above explains how to make a wallet inventory in more detail, but the basic idea behind this inventory is that it helps you quickly deal with the fall out if your wallet is lost or stolen, so this already stressful event is no worse. An inventory can help protect you from identity theft and also help you get your life back on track much more easily if this happens. Finally, I know I have this mission on the Declutter Calendar just once this year, but realistically you can't just declutter your wallet one time in a year. That isn't often enough. Instead, cleaning out your wallet is something you need to make a habit. I suggest clearing out junk and clutter from your wallet each time you also declutter your purse, which should happen weekly. 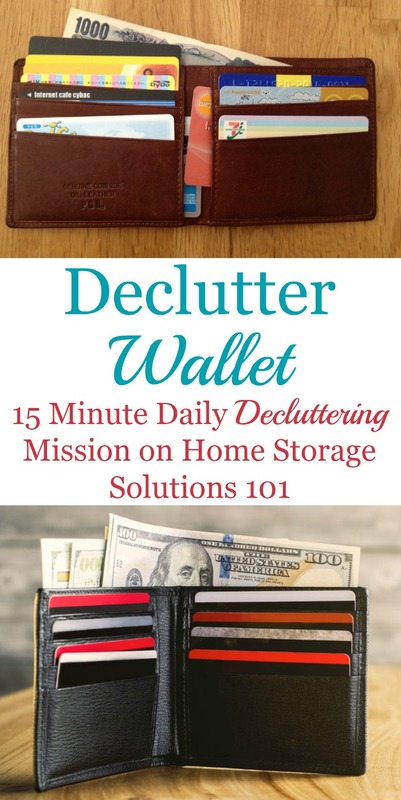 In the declutter purse mission I discussed how to make this a habit, so the same advice is true for making it a habit to clear out your wallet! I hope these instructions have inspired you to clear the clutter from your wallet. You mentioned social security card - but do you know that Medicare cards also display your social security number? And Medicare says that you should carry them with you! Thanks for telling me that about the Medicare card, although that sure stinks! The social security administration specifically instructs you to leave your card at home. It's too bad another government agency can't coordinate so that this isn't such an issue. Identity theft is such a problem, you'd think these cards would be changed. Uggghhh. While decluttering your wallet, take all cards you need to carry and scan them on both sides and put in your safe or in a safe place. I place all of mine on the scanner bed at once, scan, and turn over and scan. If something happens and you lose your wallet you have all the information you need to cancel and/or replace them. Make sure you do this every time you get new cards. I do this too, but if you do, you should make SURE you have adequate security on your computer. I drop my IP Address unless I'm actually using the internet for something. The file (or folder) where you keep such information should also be seriously encrypted with at least AES encryption or stored offline on media kept in your home, or preferably in your safety deposit box (or printed to paper and deleted from your PC). p.s. Thank you for making your "captcha" word something EASY for a human to read. Some sites do ridiculous things to these letters, that aren't necessary for blocking computer reading. Medicare is now required by law take the Social Security Number off the Medicare card. I've received a new Medicare card that has just my unique Medicare number on it, and not my Social Security Number. The leaflet that came with the new Medicare card instructs you to securely destroy your old Medicare card so that no one can get your personal info from it. A pharmacist suggested keeping a list of your medications. Emergency personnel will search your wallet looking for ID if you are unconscious. I added my doctor's name and preferred hospital to my list and will now add my ICE contact. It also saves time in the doctor's office because they can just photocopy my list instead of me writing out all the meds and supplements I take. Yes, the check book has banking information, but as for address and signature, that information is already on my driver's license, and I'm not leaving that out of my wallet! For me, I like keeping my check book in my purse just in case. Yes there's a risk, but it's also a risk having credit cards in my wallet.